Heartfelt congratulations go out to IntLawGrrl Jaya Ramji-Nogales and her husband, Luis Ramji-Nogales, on the birth of their son, Javier Samir Ramji-Nogales. 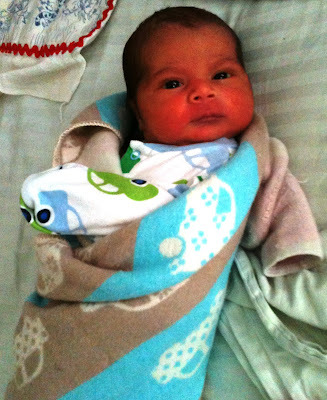 Wee Javier was born at 12:49 pm on Friday, December 16. He weighed in at 8 lbs. 8 oz., and measured 20 3/4 inches long -- more than a pound more than his big sister, Kala Elena Ramji-Nogales, when she was born in March 2008. Mommy and baby are healthy and happy, and send best holiday wishes to all!! And the greetings of the season to you and your family, Jaya!